Josh Walker, head distiller of Timboon Railway Shed Distillery is a busy man. A typical day at the office consists of running a thriving restaurant, supervising a bond store, checking in with a range of staff and greeting his customers, all the while running a distillation with his beautiful 600 litre copper pot still tucked away in the corner of the cafe. Considering all of his responsibilities, it is a minor miracle that he was able to spare the time to meet with me on my visit to the area. However he managed to locate a small window in his diary and was able to show me around, let me taste the wares and tell me the fascinating story of Timboon Railway Shed Distillery. Timboon is a small town in rural western Victoria, about 20 kilometres north of some of the Great Ocean Road’s most famous sights. It has a remarkably similar origin story to my hometown’s own Hellyers Road: a group of dairy farmers looking to diversify and bring more people to the area. 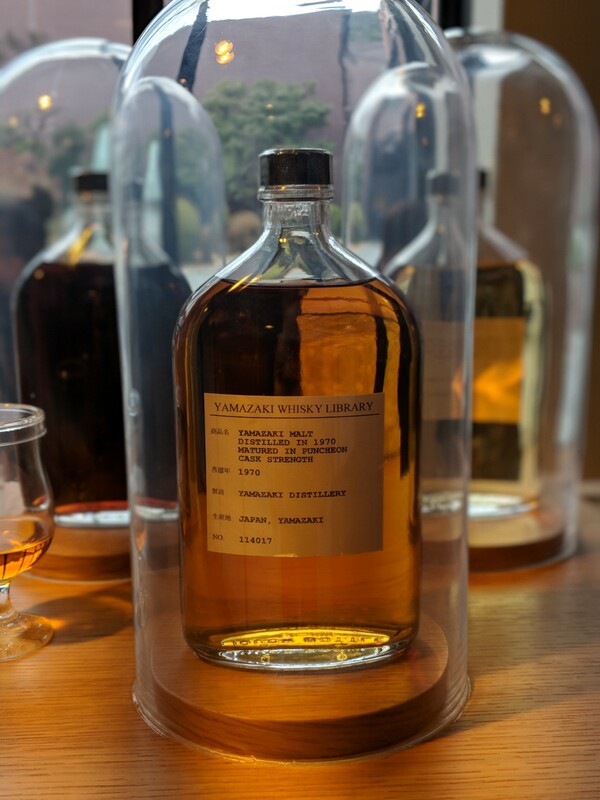 The Marwood family were unhappy with the price they were getting for their milk and branched out: first into creating ice cream, then into offering fine food, and then the final logical step – making whisky. They based themselves in a rustic railway shed which conveyed a sense of old world charm to all who visited. Before long, each facet of Timboon was thriving and head distiller Tim Marwood reluctantly made the choice to move on from the whisky side of the business. Fortunately at this point, in stepped Josh Walker, a Timboon boy and self-confessed amateur brewer. He had spent some time in breweries and distilleries in America while running an agriculture contacting business in Timboon for ten years. However, when he learned the Marwood family were interested in handing over the distilling reins, Josh decided to “turn tractors into whisky” and began learning the ropes from Tim before purchasing the business outright in 2015. Finally Josh could pursue a long held dream and make whisky. 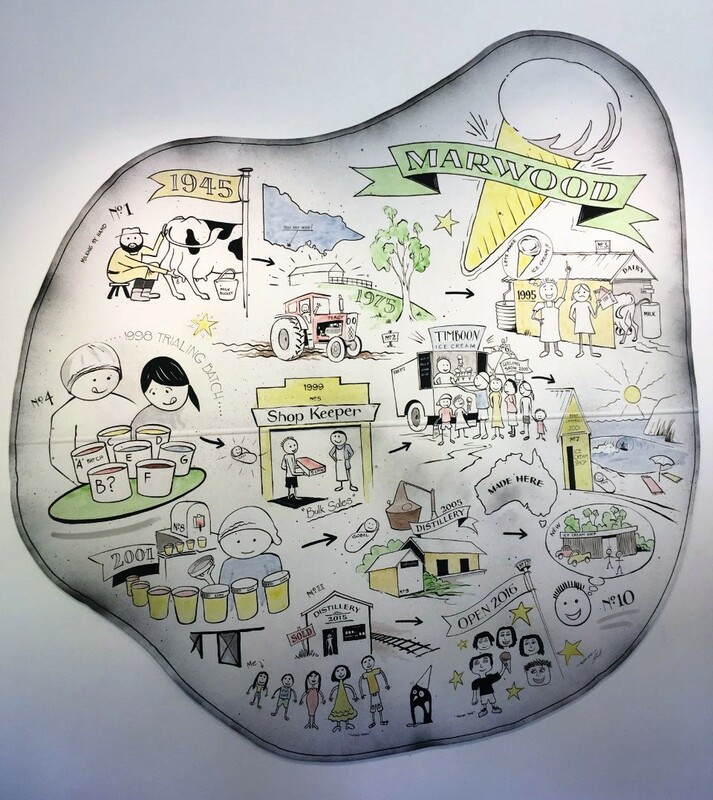 This beautiful piece of artwork is actually at the new Timboon Icecreamery – the new hub of the Marwood’s businesses and also well worth a visit – especially for big boss ice cream! The drams made at Timboon have similar characteristics to many Australian drops. Almost all expressions are matured in ex-port casks and the main bottlings are single barrel releases, coming from 225, 100 or even 20 litre casks. However, the temperature in outback Victoria sees the distillery battle with some particularly thirsty angels, regularly taking up to 7% of the barrel’s contents each year. The whisky that makes it into the bottles, however, is well worth trying. The main expression is the Timboon Single Malt. ABV varies, due to the single cask nature of the whisky, but it usually hovers at around 43%. It is broad across the palate and full of punchy fruit flavours; apples and marmalade – not dissimilar to several drops made in my home state. The cask strength, titled ‘Christie’s Cut’, contains similar elements, but turns them up to 11. Accompanying the rich, fruity, almost quince paste flavour, is a nutty marzipan note. It is exceptionally smooth for its 60% and leaves a gentle finish of cardamon and cloves. I was also lucky enough to try the ‘Governors Reserve’, a combination of two 20 litre American oak casks, one ex-port and one ex-bourbon. The result is a nose full of citrus, a palate full of creamy, custardy baked goods and a finish with ginger and nutmeg. The others were fantastic, but this was my favourite. That was, of course, until I visited the bond store. The Timboon bond store is tiny in comparison to many distilleries, however hidden amongst the few dozen sleeping barrels were some absolute gems. Josh was excited to share them and I was only too keen to try a range of incredible flavours; we could have continued tasting all afternoon if I did not have a schedule to keep. Timboon Railway Shed may be slightly out of the way for the average tourist, however if you are even vaguely within the area it is well worth a visit. There is something for everyone: a delicious restaurant, shelves stacked with local products, a bar packed with Australian whiskies and an operational still in the corner. While you are there read about the history of the area and the distillery, taste the whiskies and say hello to Josh: one of the busiest – and one of the nicest guys in the business.